It's time for Jazz Fest and we need YOUR help! The Seabreeze Jazz Festival is billed as the Ultimate Weekend of Smooth Jazz but to the Navarre Raider Band, it is our Ultimate Weekend of Making Money each year! The Jazz Fest is held each April at Pier Park in Panama City Beach, FL. Yes, it's a long ride over and the hours are long but it's only 4 days and we make a great deal of money for our program. We are very close to reaching our goal of nearly $56,000.00 for new uniforms and this weekend will, hopefully, put us over the top. So, what do we do at Jazz Fest? Well, we do a lot of things but our two primary jobs are to keep the garbage emptied throughout the venue and to run our concession stand. Our students are responsible for keeping about 30 large, rolling garbage cans emptied all day. As I've described to them, "It's like taking the trash out about 50 times a day." Also, at the end of the night, we are responsible for cleaning the entire venue. While that task seems daunting, with team work, it seldom ever takes an hour. During all of this, our parent volunteers run our concession stand. Over the next 4 days, we will cook and serve of a about 1,000 pounds of food. We serve Turkey Legs, Chicken WIngs, Sausage Dogs and Ribs along with other sides and snacks. The truth is, we need a lot of student and parent involvement. We need YOU to help us! So, how can you help? Sign-Up to work at our concessions stand or help the students with trash. I promise you will have fun. The parents have a blast cooking, serving and hanging out. The music is fantastic too! So, bring your sun block, big hats, sunglasses and your chair and spend the weekend with us! Wednesday, April 19th. - This is load in day. The time commitment for this day is about an hour on site plus driving to and from Pier Park. ​You can sign-up to volunteer for Wednesday here. Thursday is called the soft opening because the crowd is relatively light. The primary difference this year is that an extra performance has been added and we will start serving food earlier than in years past. This year, we need to start serving at 1:30 p.m.
What truly sets Thursday apart from the rest of the weekend is that the students do not come. Thursday is all about parent volunteers running the show and taking care of all our responsibilities. If you plan to help cook, I'll need you there about 9 am. If you plan to help serve and take care of trash, plan to be there about 12 p.m. The concert will be over around 10:30 p.m. and we should be wrapped up with trash and cleaning by 11 p.m. Again, the more people that are there the easier it is for us to complete everything and get out of there. You can volunteer for Thursday here. Friday is considered the true opening night and the crowd is about 6,000 by the end of the night. Our concession stand needs to be fully manned and tonight we have the students to take care of the trash. Parents will concentrate concessions. 9:00 a.m. - Cooks and Food Prep volunteers arrive. 12:00 p.m. - The rest of concession staff arrives. 12:00 a.m. - 1:30 p.m. - Students arrive back at NHS. ​You can volunteer for Friday here. This is THE day!!! We make the most money on Saturday and we need "All hands on deck". You can volunteer for Saturday here. You can sign up for Sunday here. 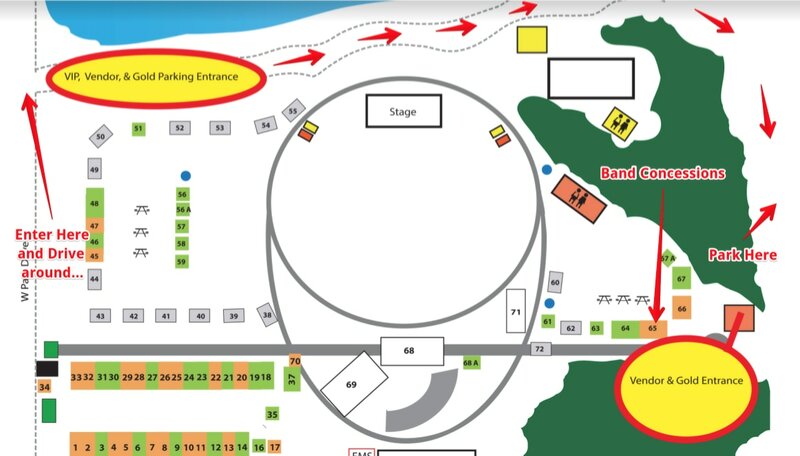 Ideally, you will be able to park in the Vendor/Gold parking area. If you are not able to park there, you will have to park in the parking lot at Pier Park. Both are well marked and easy to find. The Vendor/Gold entrance is very near our concessions area. You should be able to tell the security guards you are with the band.